Presented By – Walter Zuromski, CEC, CCE – President Owner, Chef Services Group, Inc. Chef Services Group travels to you and works with your team to customize the training to your current menu items. Consider our unique 2 hour seminar with a culinary demo or allow us to create and individualized presentation for the ideal learning outcomes specific to your operation. Trainers of the American Culinary Federation, Chef Services Group presented to over 400 executive and corporate chefs, during the national convention and its 4 regional conferences. 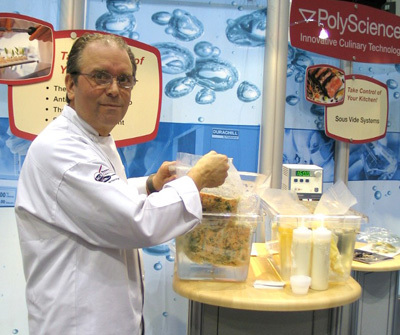 There programs allow for the integration of sous-vide techniques into your current culinary culture. Focus on food’s core cooking temperature and searing techniques. Demystifying the TDZ slow low pasteurization of food items, food safety and HACCP protocols. Retherm al la carte techniques to show the advantages of cook-chill / sous-vide. Sous Vide, a technique once confined to the realm of food preservation and banquet preparation, has emerged as a creative cooking method in fine-dining restaurants. 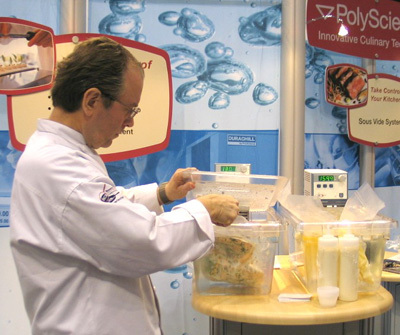 In this culinary presentation attendees will see the simple method in applying traditional flavor technique while cooking in a bag under vacuum to different food applications and environments. This presentation will also include a brief introduction to the use of functional ingredients such as hydrocolloids, modified food starches, acidulants and natural antioxidants and flavorings where necessary. Chef Services Group President and Culinary Director Walter Zuromski will present methodologies using unique and innovative new flavors, textures and operational solutions. Sous Vide technology along with the use of functional ingredients support logevity, stability, texture, increased yields and cravability/flavor. This very popular cooking method will demonstrates a practical, high culinary level that delivers very applicable results for chefs in all segments of the industry. A small step away from traditional cooking techniques, this method is not difficult to intergrade into current kitchen practices. With the guidance of Chef Services Group the adaptation of current menu items to sous-vide technique will yield huge sensory, textural and operational results. Embrace innovation with the application of this new technique. Contact CSG and Schedule your Seminar or Training today. While you’ll seldom see the words ‘sous vide’ on their menus, this cooking technique — which literally means ‘under vacuum’ — was originally utilized in the early 1970s to minimize product loss when cooking foie gras, and is now being embraced by chefs worldwide for the preparation of an array of dishes. With this technique, food is vacuum–sealed in a pouch and then slowly cooked at gentle temperatures. As a result, the food becomes tender without losing its original color, nutrients, and texture. Cooking entails heating foods to the right temperature, for the right length of time. The right temperature depends on the kind of food, e.g. meat, fish, vegetables, but also depends on personal taste, e.g. rare, medium etc. With all cooking techniques – including sous vide – heat penetrates the outside surface of the food and eventually gets to the inner part, and then heats the center to the right temperature. The problem is if you want a rare piece of beef; which means beef cooked to 125°F. You roast it in an oven at, say 400°, by the time the center of the beef is at the right temperature of 125°F the outside of the beef is way overdone because it has been heated to 400°F for a long time: there’s not just a tasty outside crust but much of the beef, excepting the center, is well done and gray. On the other hand, if you ‘roast’ it at 125°F –– which nobody would do –– none of the beef gets overdone, but it takes so long for the heat to penetrate and raise the temperature of the center to 125°F, that the whole piece dries out; or if you stop roasting too soon to keep it from drying out the center is still raw. With sous vide, you cook food at the temperature you want for the whole piece: no part is overdone or underdone; and by sealing the food in a vacuumed bag it does not dry out, lose nutrients or flavor during the long time needed to get the whole piece of food – outside and inside – to the right temperature and hence, to the right doneness. From a purely functional standpoint, cooking is the use of heat to induce chemical reactions, with different effects taking place at different temperatures. For example, the different proteins in the albumen of eggs coagulate at specific temperatures, and just a few degrees difference in cooking temperature will greatly affect just how much the egg white solidifies. Temperature affects meat in a similar manner. Cuts with high collagen content, such as chuck and brisket, should be cooked longer and at higher temperatures to adequately break down this tough connective tissue. Furthermore, those cuts with little connective tissue (such as prime rib), can begin to get tough if cooked to those same temperatures. Just a few degrees can make a difference in an expensive cut of meat, turning it from tender and moist to tough and stringy; making this another benefit of sous vide cooking, where higher temperatures are not required. The ‘art’ of sous vide cooking is in determining the perfect ‘core’ temperature you need to reach, in order to achieve the desired taste and textures. Take for example, a dish that features an egg with a creamy, custard–like texture. One chef might cook that egg to a core temperature of 143°F (61.7°C), while another may prefer cooking it to 146°F (63.3°C). While this temperature difference might seem insignificant, the finished eggs will be drastically different from each other, making each chef’s dish unique. The importance of precise temperature control underscores why Thermal Circulator technology is critical to sous vide cooking. Unlike slow cookers or simmering pans of water, the thermal circulator offers extremely precise temperature control along with ‘set it and forget it’ convenience. It can be set to cook food to an extremely precise core temperature — within a fraction of a degree — with just one single adjustment. You simply set it for the desired temperature, add the food, and walk away. Maintaining a slow cooker or pan of simmering water at just the right temperature is practically impossible, and repeatable results can not be achieved consistently. Also, because they don’t circulate the cooking liquid, these devices can develop hot and cool zones that adversely affect the cooking process. This occurs because heat is transferred 100 times faster in water than in air. This is the reason why you can reach in an oven and take out rolls that are at 250°F, but you can’t reach your hand into boiling water, even though it is at the same temperature. 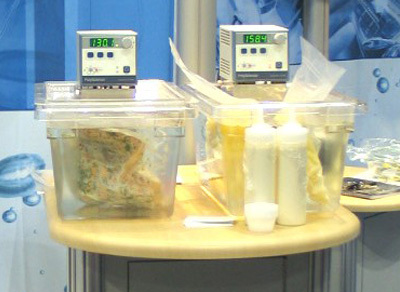 Cooking times with the sous vide technique are affected by a number of factors, including the initial temperature of the food, its mass, and heat transfer characteristics. Remember however, that its low temperatures for long periods of time that make the tantalizing results of sous vide possible. As a result, it will take some testing and experience to determine the proper amount of time needed for a dish to reach the desired ‘doneness’. the core temperature you wish to cook the dish to. the heat transfer characteristics of the food. the amount of food that will be cooked at one time. Also, the greater the cooking liquid to food ratio, the faster each portion of food will reach the proper core temperature. When cooking sous vide, cooking pouches must be completely covered with liquid and allow sufficient room for the pouches and cooking liquid to circulate freely. Another important advantage of slow, low–temperature sous vide cooking: it becomes much harder to inadvertently over–cook a dish by leaving it in longer than necessary. Once a dish reaches the desired temperature, it will take a lot more time to keep cooking the foodstuff; meaning that it can be kept at that temperature for a longer period without shrinking, drying out, or becoming tough. This is particularly advantageous when cooking expensive cuts of meat, such as Kobe/Wagyu beef. The enjoyment of food, be it a quick snack or a multi–course tasting menu at a fine restaurant, is a unique and very personal experience. To be truly fulfilling, it must please the senses — sight, smell, taste, touch, and even hearing. Who among us hasn’t had our expectations heightened by the artistry of the presentation, the aroma wafting from the plate, or the sizzle of a hot dish of beef, lamb or pork? To complement and enhance its melt in the mouth tenderness, many chefs ‘finish’ sous vide meat dishes with a brief grilling or pan/blowtorch searing, inducing a Maillard reaction and thus creating the familiar aromas and flavors that come only with high–heat cooking. The critical difference with food cooked using the sous vide technique and finished in this manner is that the interior remains exceptionally tender and moist and there is very little, if any, of the shrinkage that occurs with traditionally grilled or roasted meat. Set the Thermal Circulator or Thermal Bath to the desired cooking temperature and heat the cooking liquid. Place the vacuum sealed food in the heated cooking liquid. The Thermal Circulator or Thermal Bath will apply additional heat as needed to maintain the cooking liquid at the desired temperature. And remember, while you can’t inadvertently over–cook a dish with the sous vide method, you can under–cook it if you remove it from the heated cooking liquid before it reaches the desired core temperature. 2 Hour Culinary Presentation and Seminar as Presented to the American Culinary Federation in Boston, Chicago, Seattle and Charlotte regional Conferences. For Sous Side recipes please contact us. Contact CSG Today for Your Sous Vide Training and Needs Today!